Happy Easter! I love Sunday roast dinners, especially roast lamb, so today as it's Easter Sunday I served up roast shoulder of lamb with roasted vegetables. Lamb is traditionally served at Easter although in actual fact the serving of lamb goes back to the first Passover of the Jewish people when the sacrificial lamb was roasted and eaten, with unleavened bread and bitter herbs in the hope that the angel of God would pass over their homes and bring no harm. As Hebrews converted to Christianity, they naturally brought along their old traditions. The Christians often refer to Jesus as the lamb of God, thus the traditions emerged. After our delicious roast lamb, I wanted to serve up a light pudding. 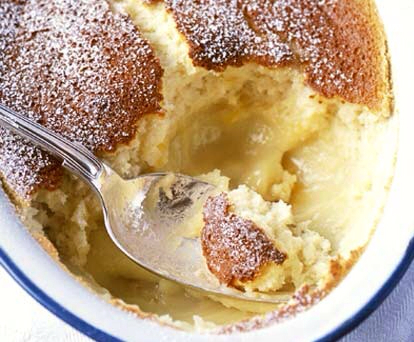 This self-saucing lemon pudding is an easy recipe to prepare which tastes light and delicious. Add the butter, sugar and lemon zest into a large bowl. Whisk together until pale and fluffy. Add the lemon juice, egg yolks, flour and milk one at a time whilst still whisking. You should end up with a fairly wet cake batter. In a separate bowl which the egg white until at the firm peak stage. Add to the cake batter and fold in. Pour the mixture into a buttered ovenproof dish. Place in preheated oven 180C and bake for 45-50 minutes, or until the top is golden brown. Dust with icing sugar before serving. The resulting pudding should have a light lemony flavoured sponge with a thick lemon curd sauce underneath which can be served with custard, ice-cream or pouring cream. Either way, it will taste delicious and because it's so easy to prepare, you'll be making it on a regular basis.